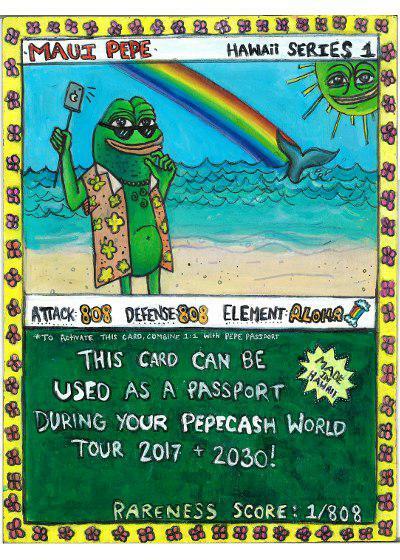 Amazeballs, we have our own RarePepeNews rewards token, which is also a certified Rare Pepe. Rare Pepe News rewards token (RPN) has been created to pay bounties and reward content contributors to Rare Pepe news. We have minted 20,000,000 indivisible RAREPEPENEWS. You can earn RAREPEPENEWS by writing and submitting Rare Pepe News articles. We pay 2 RPN per published word. So you’ll earn 1,000 RPN’s for a 500 word article, 2,000 RPN’s for a 1,000 word article. Your submissions must meet our editorial guidelines. Which we’ll publish very soon. For now, they’re a secret. Try your luck, send your stories along with Contributor account requests, to rarepepenews(at)gmail.com. As you can see so far this site is quite sparse visually. We’re offering the following bounties to help spruce the joint up. You can also receive free RAREPEPENEWS tokens from the SatoshiNakamoto.JP faucet, or from signing up to our newsletter (1,000 RPN) or retweeting us on Twitter (200 one time) or sharing our content on Facebook (200 one time). Rare Pepe News logo = 20,000 RPNs for the successful accepted logo. Update: Logo bounty won by @OurEverydayEarth on 2016-10-19. No other submissions were received. Rare Pepe News masthead = 20,000 RPNs for the successful accepted masthead. Update: Masthead bounty won by @OurEverydayEarth on 2016-10-19. No other submissions were received. An unannounced bonus of 20,000 PEPECASH was also paid to @OurEverydayEarth. Rare Pepe News Theme Options customisation and styling = 10,000 RPNs. This will consist of styling to impart a suitable Rare Pepe colour scheme to the site, as well as enhancing site UI/UX on both desktop and mobile, while retaining a certain degree of elegance and refinement. FYI if you’re interested in this styling and customisation gig, you’ll need to be accomplished with Divi/Extra themes from ElegantThemes.com, as RarePepeNews.com uses the Extra theme by Elegant Themes. All digital assets created and supplied in exchange for RarePepeNews tokens become Copyright of RarePepeNews.com.